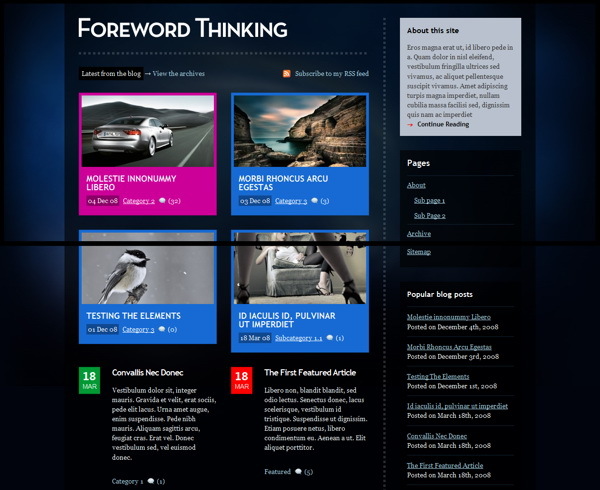 Foreword Thinking is a neat 3 column design with a “table of content” magazine-styled home page. This theme comes bundled with a movable sidebar, a customizable featured posts section, 10 theme styles and the ability to set alternating colors for specific areas of the design. The theme has a custom home page with a “table of content” designed blog section, featured posts and two available page modules that can be set in the theme options; randomizing color styling for featured posts and date blocks with colors editable in the theme options. You get a completely widgetized sidebar with 7 custom widgets that you can use, the ability to interchange between a left and right sidebar and 10 different styles to choose from. Making simple changes without editing code, like adding your own logo, changing to an alternate color style, adding Google Analytics code, couldn’t be easier with the back-end theme options panel. The theme is compatible with all the modern web browsers like Firefox, Safari, Chrome and Internet Explorer. There is an image resizer script built into the theme framework to automatically scales your post images for pixel perfect display in our templates. No need to upload new cropped images when re-designing your website. It comes packaged with a .po file for easy WordPress theme translations into your desired language – editing one neat little file without hunting down text in the theme templates.